Remember the Nex Check Halter dress by Marc by Marc Jacobs? I blogged about it a few weeks ago thinking that blogging would take it off my mind, but I still want it! It gets many ticks on my list of criterias for an ideal dress: cute, versatile, nice material, good colours, plain enough to be worn more than once without being too plain. Miu Miu bags have had that golden buckle design for a few seasons but I'm still really liking it. This tan leather bag looks like such a nice and casual day bag. Black classic Christian Louboutin shoes. No explanation needed. 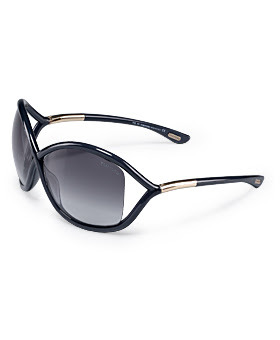 Tom Ford's Whitney sunglasses. I don't care how overrated Tom Ford is. There just aren't a lot of sunglasses out there that look so cool and fit me as well as this pair. BG did a post on Tiffany rings a week ago. The one I want is the Frank Gehry Fish ring in brushed sterling silver (or perhaps plain sterling silver). I haven't seen it in real life yet, but I imagine it would look like a small, sleek sculpture on my fingers. Loves it! 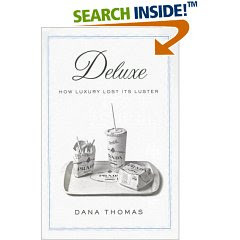 I was looking at the calendars of TV shows on Amazon, but I was disappointed not to find a Deluxe: How Luxury Lost Its Luster by Dana Thomas is a book about the fashion retail industry. As an over-thinking shopper, there are all sorts of little facts I would like to know in this book. I'm still waiting for it to come out in paperback. Gossip Girl calendar. Really, don't they know how many girls would love to be able to stare at the gorgeous actors and actresses throughout the year? (Plus wouldn't it be good marketing for CW?) Anyhow, if you haven't read the Gossip Girl books yet, go read them! They're not the same as the TV show but still very juicy. Veronica Mars is one of my favourite shows of all time and this TV season just hasn't been as exciting since the show's was cancelled. 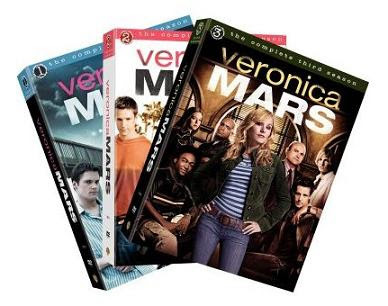 So everyone, get yourself the Veronica Mars DVD box sets! Have a fabulous Christmas people! We'll see you in the new year! Catering to vanity, we have this very pretty mirror from UO (though personally I'd like one of those SERIOUS vanity mirrors with the light surrounding it). Then there is this set of photoframes. When I get to design my own room, I aspire to have a wall of simple photoframes just like this with pictures of fashion inspiration, artsy photos I've taken, my family and my friends. This set is also from UO. As much as I don't really like the quality of UO apparel, I DO love their furnishing and bits and pieces. They are all so funky, funny and cute, yet affordable. They make the perfect gifts! More photo related things, there is this photo clutch and this snow globe frame. I LOVE the snow globe frame. I bought two this season and lugged it all the way across the Atlantic. Another thing I wouldn't mind receiving would be a fun board game like this Grey's Anatomy and I've Never board game. A few months ago, I would've scoffed at the idea of board games as something little kids played. But after a really quite excellent house party this Thanksgiving, I'm a convert of board games. Its a great way for a large group of people to bond and have fun. Gift cards is also a very good idea. As unpersonal as it sounds, it really is the best thing to give if you have no idea what the other person wants. Better let them get something they like than get them something they don't like that will end up cluttering the back of their closet. Choose a store they like, and if you have no idea what that is, department stores like Bloomies and Saks are a good idea. For the younger generation who shops online, Shopbop is also has gift certificates. Ok, so this might not be exactly THAT affordable, but it does come in different price ranges! This season, I have really liked FCUK's selection of dresses. 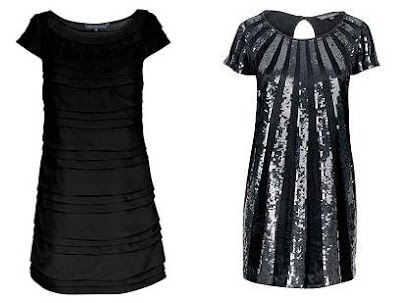 They have a fantastic selection of shift dresses (basically like a huge T-shirt,) which are young, sparkly and trendy. I liked them so much that I've been to French Connection more than to any other high street store this season and tried on most of their dresses in store. The last time I went to the FCUK shop in Covent Garden, all the salesgirl were wearing one of FCUK's dresses in their own style, (with their own accessories). The whole store felt so festive! I really like how the studs are of the same colour as the dress (so the dress wouldn't look like one big mess) but they're just light-reflecting enough to see the pattern. The problem with sequinned and studded dresses though are that I can't really get a tailor to cut the dress shorter. The dress ends at almost the knee for me, when I think it's supposed to end mid-thigh. Sigh. I've only seen this dress online before. I like that it looks so cute and summer-y and party-ish. Tube dresses are hard to wear though, and the bubble effect at the bottom doesn't make it any easier. But still, if you were partying on some hot and resort place, then you might want one for the parties! BG and I like to imagine we have fancy dinners to go to (without going out afterwards,) so we thought these dresses would we perfect for the dinners. 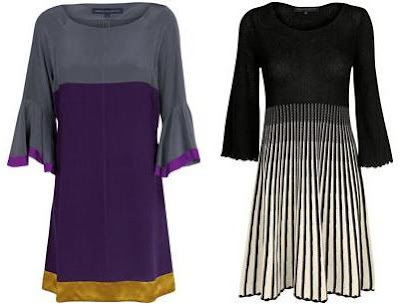 I really liked the silk, block coloured dress on the left, and BG like the knit dress on the right. Unfortunately, hardly anyone dresses up for fancy restaurants in Hong Kong so the only place we would get to wear dinner dresses would be in the States and London. Perhaps the two of us should organise a fancy-dress-wearing dinner sometime. Two other dresses that would be great for dinners. Now I thought this lime green dress looked pretty chic when I saw the model wearing it. However on me, it wasn't short enough and it felt and looked like I was wearing a green box -wide and flat. The difference between two colours of one dress never looked so apparent until this dress. The light-coloured one is so much prettier. No wonder it's sold-out whereas the pink/purple dress is now on-sale in stores. Pretty by itself, but not sure how pretty it looks on a person. I really like colour-block designs and the sequins make the design look young and 'now'. I still haven't managed to try it on yet, although I did notice that it was accessorised with a wide belt at the FCUK window displays. What do you think of the FCUK dresses this season? Bought or tried on any? For once I actually managed to watch the ANTM finale without knowing who actually won. It was that much more exciting and fun to watch. So yes, I am now going to talk about the finale and who won etc etc. Don't say I didn't warn you! Overall, I thought the quality of girls this season was better than the last and that they were in general more likeable. There was really nothing much to complain about, it was a decent round of ANTM. Not terribly compelling but not horrible either. I DO love the fact that they went to China though. China looked really pretty, exotic and fun through their lense. I've only personally been to Shanghai once a few years back (well..maybe 5) and didn't quite get the vibe that they portrayed...maybe its time I go back again! I thought the final runway for Qi Gang in this exotic palace next to the Forbidden City (is that what they said?) was very awesome with the dancers on stilts etc. It was all very oriental and grand. Though maybe the whole entourage thing following Tyra down the runway to her throne was a bit too much..... Qi Gang's dresses were also really gorgeous in an oriental couture sort of way. I especially loved the grey dress Chantal wore on her second run! Judging from over all performance, I do think that Saleisha was the right choice between the two finalists. I mean, both girls were there for the right reasons, both were very loveable and both took very good pictures and all, but Saleisha clearly rocked the runway. Even minus the tripping the stilts guy with her dress incident, Chantal's walk wasn't that inspiring. Random thought: doesn't Saleisha look like a model even before her makeover? Though I think her new hairstyle is very cute. It took her a while to grow into it, but she eventually did. I wish I can carry that off without looking like a mushroom head.....Oh and you got to admire her make up application. In some scenes in the show, she totally had huge eye bags. But she covers it up so well. What did Tyra say? Brown eye liner on bottom lid? Saleisha's continuously good photos. I loved the jumping one at the Great Wall, she really went out of the box there. The only one I didn't like was probably her Garden of Eve one, which had really dead eyes. Besides her catwalk, I think I was secretly vouching for Chantal, just because she's soo cute and I like her personality just a teensy bit more. She also did a better job in the Covergirl commercial. I loved the dragon dance photo shoot. The colors were just so exuberant and she just looked so edgy here. Then there was Jenah who came out third. It really was too bad about her misunderstood personality. She indeed takes very very gorgeous pictures- I especially love how she looks in this rock climbing one. I thought her come around speech in the judging room about why she's misunderstood was also very eloquent and well done. Too bad her competition was just too strong. Now here is a girl that I cannot believe lasted for so long. I thought she did a good job at the Go See's and was very professional and really wanted this. But to be honest, I just didn't like her look. I don't mean to be mean or anything, but I just didn't think any of her pictures made her look very good (edgy wise or pretty wise) no matter how much make up, super photography, angles and photoshop applied. She looks kind of....scary manly. And then there was Heather. Ah Heather. There was no question that she was amazingly pretty and effortlessly took beautiful pictures (if only we all had this gift). And it is indeed very brave and incredible that she was able to overcome her Asperger Syndrome in this competition. But I thought in the end, she really just couldn't handle the stress of being in the competition. Especially when she had so much trouble with the Go Sees and getting along with the girls. The modeling world and the fashion industry really don't cut anyone any slack. Other random thoughts. I can't believe that Ebony just gave up like that and she really DID have an attitude problem no matter how much she said she was misunderstood...Hmm what else is there to say about the show this season... there really isn't much. As I said, it was a "not bad" season. None of the photoshoots were terribly exciting, but then maybe I am just getting jaded after having seen 9 seasons of this show and the countless photoshoots. Maybe it is time to make a graceful exit Tyra. 10 seems like a nice complete number. Silk clothes are all the rage these days. Silk is great in that it makes your clothing, whether its from a high-street store or a designer shop, look expensive and sleek. Another great thing about silk is that it really lets bold colours (another trend this year) really shine out. But one really annoying thing about silk clothes is that you can't just throw it into the washing machine, or even handwash it for that matter. And dry-cleaning is so bothersome and costing that I prefer wearing the silk item many times before bringing it to dry-clean. This is how they look like. 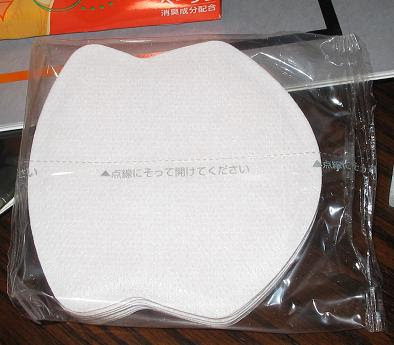 Basically, you fold and stick one piece onto each underarm area of the top/ dress. It's like using bandage. The white cloth supposedly has anti-smell properties so it prevents armput BO from adhering to your silk top. And after a night out, I peeled the sticky sheet off my silk dress and it didn't ruin the silk at all. Great huh? It totally made me feel like I could be less conscious about not ruining my silk dress last night. 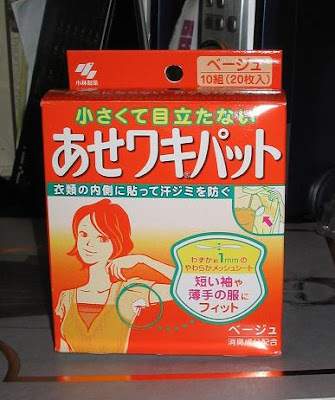 So if you feel the same way about silk clothes, go see if they sell these in the Japanese drugstores near you! Out of all the super designer footwear brands out there like Manolos and Jimmy Choos, my favourite is Christian Louboutins. I really want to be able to say that I love them all, but I've been to the stores and tried them on and to be honest, I've never really seen anything at the Jimmy Choo store that I really wanted to try on. As for Manolos, physically the designs don't look too special either. I heard it was the angle of the arch that is crazy comfortable, but I don't quite need that at this point in my life yet when there are so many decently comfortable black pumps out there still i.e. Fiona by Cole Haan. So yes, Manolos and Jimmy Choos are like wine- an acquired taste developed over time. For me, the charm for Louboutins are just more obvious. Their designs are just more elegant and me. For their classic pumps, I like how the pointy toes are just so and is not severely pointy like the Manolo ones nor too blunt or god forbed- squared! Their non-classic designs also just seem more youthful and fun. They also do a very nice slightly pointy yet well rounded toe. And isn't the whole silohuette just so gorgeous? 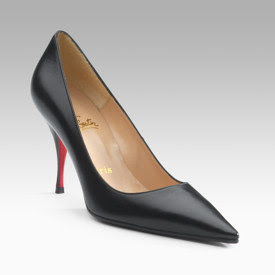 And of course, there is also the signature red sole, which is just sooo cute! Although it makes me wonder, what happens when one walks on it for a while and the red sole is no longer red? Isn't it so sad to ruin something so pretty? I mean I know I shouldn't care too much, but personally I get upset when there is so much as a scratch on my new shoe (hence I am also the type who wants to "save" things for special days, but I am gradually learning the error of my ways in tha respect). How does everyone else deal? Or do Louboutin girls just don't care? One positive thing about spending the holidays back in Hong Kong is the temperature -it's cool enough to wear a cute jacket but warm enough to wear skirts and dresses without freezing ones legs. In the past, tights used to mean that it was so cold I had to wear them with my school skirt. But this year, for the first time, I'm actually considering wearing black tights as part of a casual outfit. (OK, so everyone does this, but it's new to me.) I'm imagining outfits with short cotton dresses or very long tees with black leggings -kind of Olsen-esque. Another tights-related style I'm thinking about are coloured tights. Now I've never been an adventurous dresser, so I'm certainly not thinking of wearing colourful tights with crazy coloured shorts and tees, (80's style.) I'm thinking more of the girly, simple way like the images (above and below). I think the key to this look is really to keep the outfit simple. Basically, keep everything else but the tights black or neutral-coloured. To be honest, wearing colourful tights seem like a lot of effort to me. I mean, do you know how many colours and degrees of sheerness of tights there are out there? What is the difference between '50 den' and '80 den' tights? What does 'den' mean anyways? Just the thought of buying a pair of coloured tights is enough to keep me away. But the argument of you're-only-young-once, and you can't exactly wear coloured tights when you pass a certain age is making me consider having some fun with this trend. Are you wearing coloured tights this season? If so, how are you wearing them? I have a thing for rings. Besides my silver hoop earrings, I think that my next best jewelry investment is my 1837 Tiffany ring. I've had it for around 3 years now and I wear it everyday. It is one of those pretty accessories that matches anything and is perfect for all occasions. It is simple, clean cut and not too overtly Tiffany's (unless you look at it this closely). I love it so much, I even paid $10 to get it cleaned at Tiffany's once. Unfortunately for me even after the cleaning it didn't look like new. I guess all that banging and clanging from daily wear has finally taken its toll. So just as a fun exercise, I thought I'd look at more rings from Tiffany. They DO make great presents after all *hint hint*. For a more elegant and delicate design, I am loving these two (left: open heart, right: closed heart). Though as girly a girl as I am, even I find the heart a little bit too girly for daily use (hmm maybe unless it meant something....). The closed heart is more versatile since it really looks more like a oddly shaped bean than a heart. Even simpler, there is the Cushion (left) and the Torque (right). There is no question the versatility here. The Cushion is a little TOO simple for me (if I'm going to spend that kind of money, I'd like something with a bit more design and effort). I love the twisted design of the Torque, though I do wonder about how comfortable it is with all the odd angles. I think out of all of them, these two strike the best balance between versatility and design (left: Somerset, right: Knots). It is simple yet unique. Though personally, I think the Somerset is a bit too bulky for my fingers. I much prefer the Knot, with its feminine yet simple design. So yes, these are my just some of thoughts on Tiffany's silver rings. And the best thing about these choices in my opinion is that they are not the typical Tiffany designs. We have enough of those floating around as it is. So waistcoats/vests have been around for a while, but it must be one of those things that grows on you because now that I've seen so many people on the streets and on tv wear it, I really want one! Luckily for me, judging from the Phillip Lim 3.1 (left) and Alice + Olivia (rght) catwalk above, the waistcoat trend is still here with us this season. So I started out looking for one and almost bought this very classic tweedish one (right) from Urban Outfitters the other day. As far as waistcoasts go, this would match with a lot of outfits and the fit was pretty decent. I think the back is also a black satinish material, which I thought was interesting. Only downside was that the tweed material was really rough and since this waistcoast was not on sale, I didn't think it was worth the $42. They need to consider repricing UO...... On the other side of the Atlantic, we have this other classic waistcoat (left) from Top Shop. Something more interesting, we have these two from Top Shop. Not too sure how flattering the blue one would be (left) but I LOVE the military inspired one (right). Something more party-ish, we have these colorful shiny options from UO (left) and Vena Cava (right)- a great way to add some character to your party outfit. Though I think for satin, the cutting is very important and you can already see thee poor cutting from the picture here for UO (I do like the color though)- so be careful! UK's high street stores have been pushing and selling a lot of 20's style this party season. Now for those living in the States, where retailers tend to sell clean-cut clothes, you might not really know how a modern 20's dress looks like. Remember the dress Kate Moss wore to Fashion Rocks this year? Think of a short, non-volume mini-dress; think beads and drop-waist. 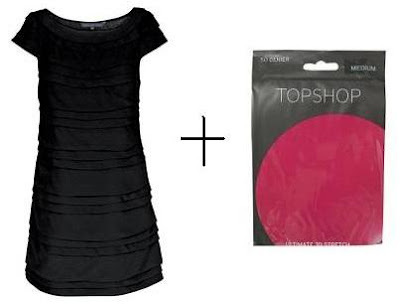 The two featured above are the examples I like (from Kate Moss Top Shop and Oasis). 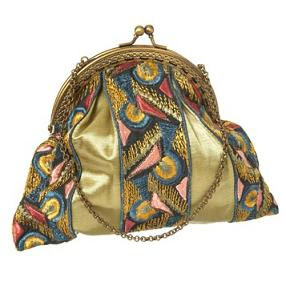 One of the main features of 20's style bags are frame bags. The first one that caught my eye is this golden, embroidered one from the Kate Moss Top Shop collection. It's more casual than the other ones and so pretty. Plus, doesn't it look like I had to go through vintage stores to dig it up (minus the effort)? 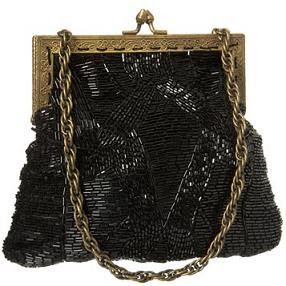 Another feature of 20's style bags are beaded bags. One that caught my eye is this black beaded one, also from Kate Moss Top Shop. It's simple but with just enough pattern detail. Warehouse has one which is a bit more fancy -lots of gems. Not really my style though. Oasis also has a range of beaded bags. My friend just bought the one on the left in black. 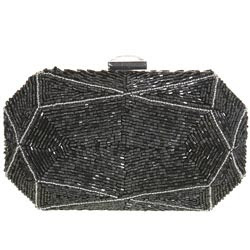 One good thing about these bags is that if matched right, they can be carried in 'usual' functions like to cocktails and even clubbing, or to more dresses-up functions, like weddings and dances. Even though it's kind of plain, I would like to see this bronze pouch in real life. If it's big enough to be somewhat practical (although I suspect it's not), at 18 pounds, I might just buy it. If these aren't fancy enough for you, how about this box-bag from Top Shop? 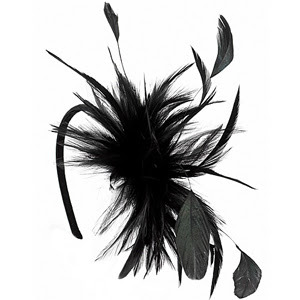 And if you're really into the whole dressing up thing, this feather hairband from Accessorize is a fantastic accessory to add onto your outfit. It's easy to wear and adds just the right amount of dressiness. Just make sure you don't put too many things together and wear the accessories to stuiable events. 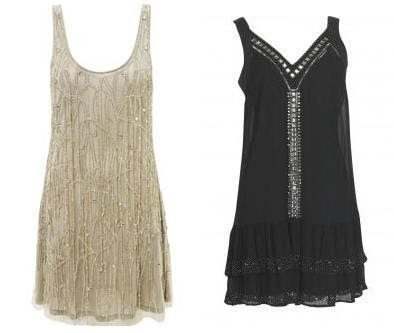 Do you like this whole 20's style party clothes revival by the UK high street? End of Quarter Shopping Spree!